In honor of Food Revolution Day, which is today. I have collected quite a few of Jamie Oliver’s cookbooks over the years, and like his approach to getting people to cook. I decided tonight to share a favorite “recipe” in order to take part (unofficially) in the festivities surrounding this global event. Anyone who regularly reads my blog knows I love to cook. 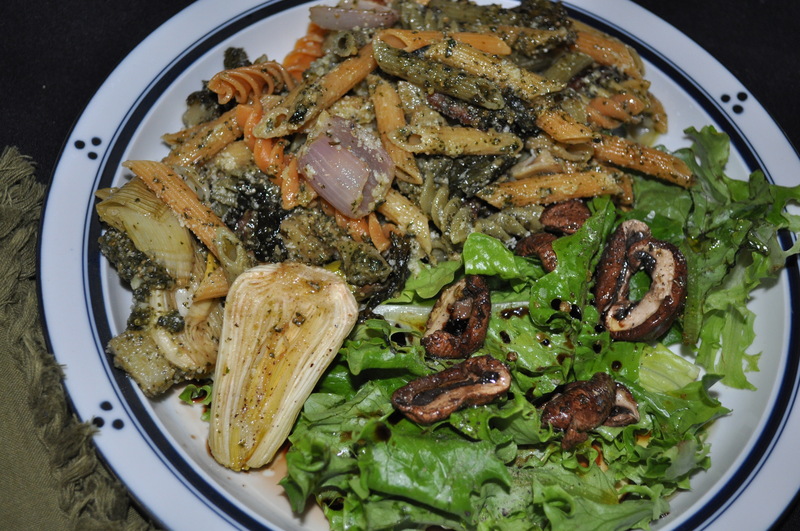 I enjoy doing new things with my CSA and farmer’s market finds, and we eat mostly home cooked made from scratch meals. This is an easy favorite for us. One pan pasta “primavera”. You need whatever veggies look good to you that could be roasted. 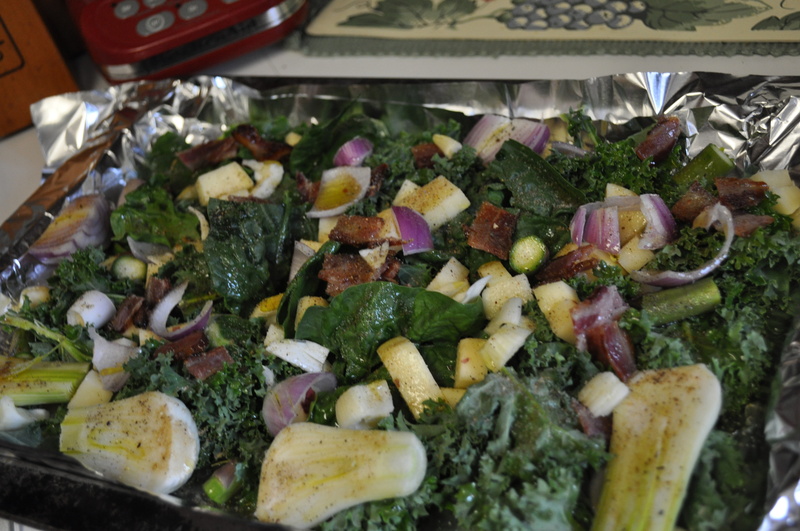 This time I used kale, spinach, spring onions, red onion, diced red potato and TLV Tree Farm uncured bacon. I made the entire package of bacon over the weekend. In the oven, then put away to use. It probably made its way into five or six meals. For this recipe I used four slices, cut into square pieces. I just put all the veggies on a foil lined pan, drizzle with olive oil, add salt and pepper and oregano. Put in a 300 degree oven for about 45 minutes, in order to get the onions and potato done. Just before dinner I put four ounces of mixed pasta on to cook, and took out some pesto from the freezer, and those marinated mushrooms I made last week. Here is that recipe on Hunter Angler Gardener Cook. I only have one more container of pesto in the freezer. Can’t wait for garlic scapes to come in, so I can start restocking for next winter. I had some greens left from the Burtonsville Market. This is what dinner looked like. My husband’s plate. Filling, good, easy to throw together, with about two slices of bacon as the meat in this dish. Pastas are simple standby meals around here. 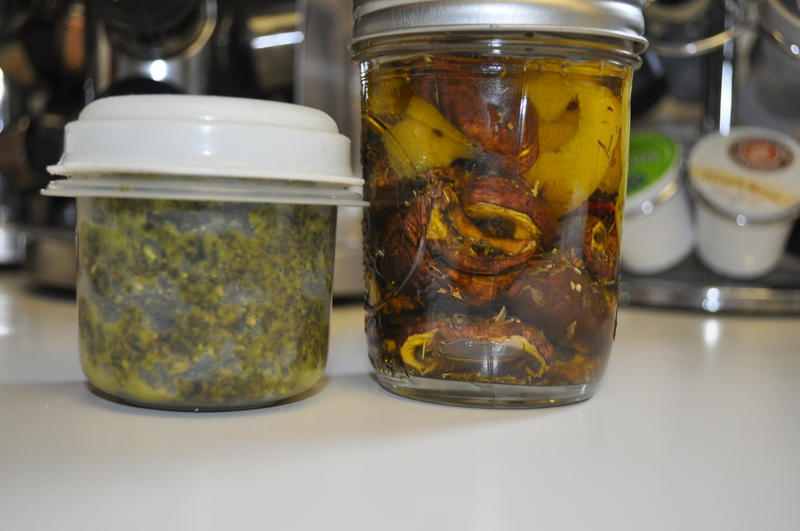 Tomato sauce or pesto from the freezer. A small amount of protein. Lots of veggies, either steamed or roasted. And, for us on a Tuesday night, it emptied the fridge of CSA veggies to make room for the Wednesday pick up. Posted in CSA, Farmer's Markets, Food, Local Businesses, Locavore, Real Food and tagged cooking, CSA, farmer's markets, Food, foodie, Howard County, local businesses, Locavore, real food. Bookmark the permalink.